You'll be on the edge of your seat reading tales of cops, robbers, criminals, and lawyers with this little tome that packs a lot of heat. Do you like to read great stories? This book is loaded with them! We've rounded up the best cops-and-robber articles we've ever done--plus a rogue's gallery of new offenders. You'll read about dumb crooks and criminal masterminds, mafia henchman and low-level goons, ancient warriors and Old West gunslingers, crazed cops and jovial judges, and even a few loony lawyers and crooked Wall Street types. 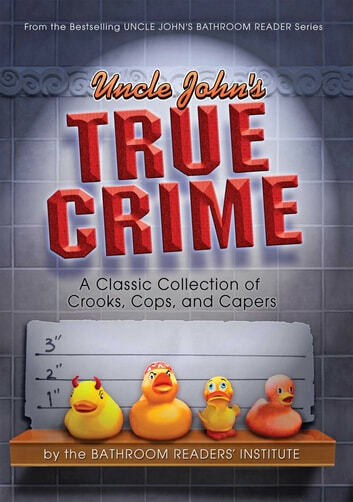 It's the True Crime book that only Uncle John could make! Here are some of the unusual suspects . . .
* New York City’s "Mad Bomber"
Uncle John's Bathroom Reader For Girls Only! If You Come To A Bridge, You've Gone Too Far! Uncle John's Facts to Go Playtime!